The greatest center in NBA history played his final regular season NBA game on April 23rd, 1989. Kareem Abdul-Jabbar started for the Los Angeles Lakers, in his 1,560th career regular season NBA game, against the Seattle Super Sonics at the Great Western Forum. Abdul-Jabbar started and played 26 minutes, scoring 10 points on 5-6 shooting with 6 boards, 3 assists, and a blocked shot. These points brought Abdul-Jabbar to an unassailable record of 38,387 NBA points, which stands today by nearly 1,500 points over Karl Malone’s career mark. The Lakers won the April 23rd game against the Sonics by a score of 121-117 as Magic Johnson led the charge with 29 points, 21 assists, and 9 rebounds for the 57-25 Lakers. Kareem and the Lakers went deep into the NBA playoffs, appearing in the NBA Finals for the third consecutive season. Abdul-Jabbar was inducted into the Naismith Memorial Hall of Fame in 1995 and was named to the NBA’s 50 Greatest Players team in 1996. Offered here is the final regular season game ball of Kareem Abdul-Jabbar’s incredible and record-breaking career. This is the actual ball used to score the final points in Kareem's career. 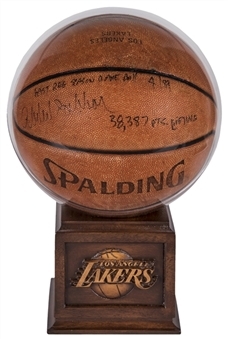 This Spalding Official Game Ball bears the facsimile signature of NBA commissioner David J. Stern and is printed with “Los Angeles Lakers”. Kareem has signed the panel of this basketball north of the Spalding wordmark in black marker. Inscribed near Abdul-Jabbar’s instantly recognizable signature is “Last Reg Season Game Ball 4/89” and “38,387 Pts Lifetime”. This historically significant basketball comes in a custom Los Angeles Lakers display. 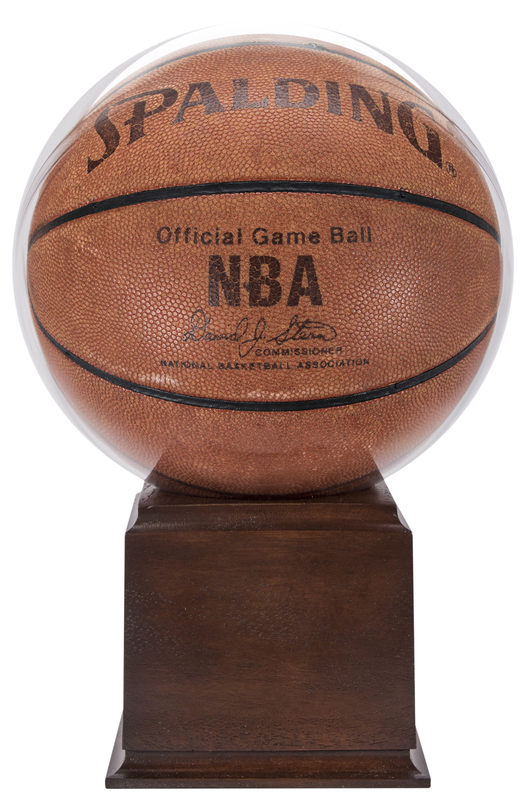 The display is a 6 x 6-inch wooden pedestal engraved with a high-relief Lakers logo topped by a spherical basketball display. It measures a total of 15 inches high. 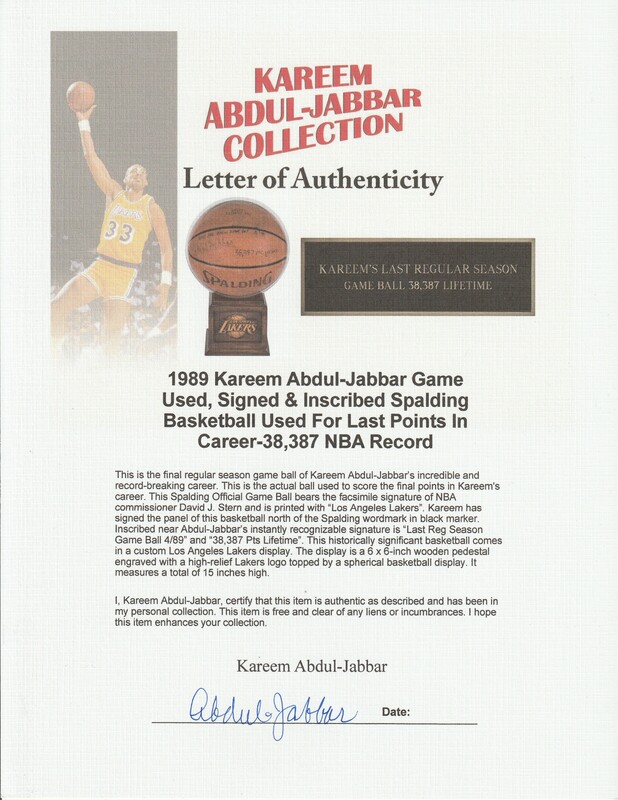 This incredible and unique offering comes with a LOA signed by Kareem Abdul-Jabbar himself.